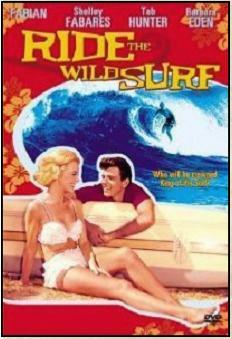 NiteOwl Review: Leonard Maltin said of Ride the Wild Surf, "It's not Shakespeare, but it is a cut above the usual Beach Party shenanigans and the surfing footage is great." Our NiteOwls group ran it during our surfing marathon and agreed. It rated with the original Gidget with Sandra Dee (not an insult, most of us had pleasant memories of Gidget). Peter's blonde hair took some getting used to. Apparently the surfing footage in the movie was filmed before Peter was cast as Chase, so Peter's hair had to be dyed to match his surfing stunt double. There is no known film production issue to explain Barbara Eden's dark red hair. Ride the Wild Surf follows three California surfing buddies who come to Hawaii during Christmas vacation to ride the big waves. This being the 1960s, there were no female surfers. 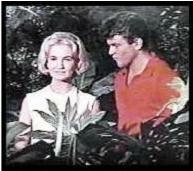 The title song is performed by Jan and Dean. When he sees her exercise her skills as a black belt at a beach party, he labels her a girl nut. She challenges "Ivy League" to take her on and he refuses to take back the girl nut label even when she has her foot on the back of his neck. When Chase leaves the party with the excuse that he needs to change his clothes, she follows with dinner as a peace offering. After soaking him with beer when she opens the cans, they find (duh) that they like each other. The match up of Peter Brown with Barbara Eden worked much better than we expected. Jody Wallis (Fabian) is a self-described surf bum, disillusioned with his parents, college and life in general. After only a week of college he gave up his dream of being a marine biologist and took to the surf full time. Brie (Shelley Fabares with disconcerting platinum hair) tries to convince him to return to school. She sees him as someone who gives up when the going gets tough. As with Chase and Augie, their meeting at the beach party does not go well at first. Jody takes a risky bet and fires a harpoon at a pineapple over Eskimo's head. Brie is not impressed. However, when they find that Augie and Chase are having a good time, Brie and Jody go for a walk and hit it off. Shelley Fabares, fresh from The Donna Reed Show, used an irritatingly prissy voice which was quite a contrast to her forceful, dynamic persona thirty years later in Coach. 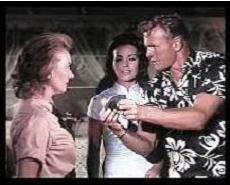 Steamer (Tab Hunter) doesn't have any character flaws that need a feminine fix. He's a hardworking, reliable, blue collar kind of guy. 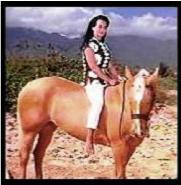 When he sees Lily on the beach on her horse, he's in love. He goes to the ranch Lily runs with her mother. Lily tells her mother he works for the local garage and came to fix their truck. Lily tells Steamer that her mother hates surfers because her father was a ne'er do well surfer who left for Bora Bora three years ago and never came back. When Steamer falls in love with Lily and wants to stay to help on the ranch, they tell her mother the truth. Her hostility drives him away. Later, Steamer convinces Mrs. Kilua he's a hard working guy by showing her his bankbook. The surf finally comes up at Waimea Bay, the site of the competition which is the true testing ground for surfer courage. After the grueling surf eliminates the others, there's a final showdown between Jody and Eskimo. We have some face-saving outs for Jody's buddies. 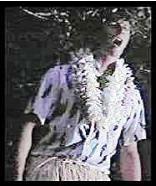 Chase has a cracked rib from diving off a cliff while drunk (and wearing a grass skirt) to prove to Augie he can do something crazy. 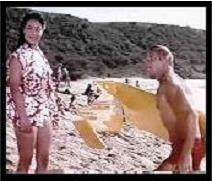 He has to be rescued by Jody, who due to a prior crack-up, has been hesitant to take on the waves at Waimea. Rescuing Chase gives him back his confidence. Steamer breaks his board but finds Lily's mother has had a change of heart so he comes out ahead. Jody takes the last wave in what is touted as a demonstration of strength of character. Chase Colton (Peter) is a preppy, college boy from a wealthy family who tends to be cautious and uptight. 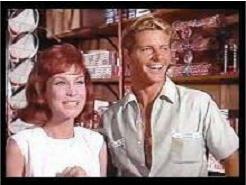 He meets his match in Augie Pool (Barbara Eden) who makes it her mission to loosen him up.